This weeks chapters seem (to me anyway) to be average. Basically all three chapters are probably transitions between exposition and action. In this chapter we are shown the heartbreaking story of Rebecca’s life and her relationship with Thunderous Soldier of Rage . Thunderous became Rebecca’s guardian after her mother was killed. Thunderous then vowed to protect her. 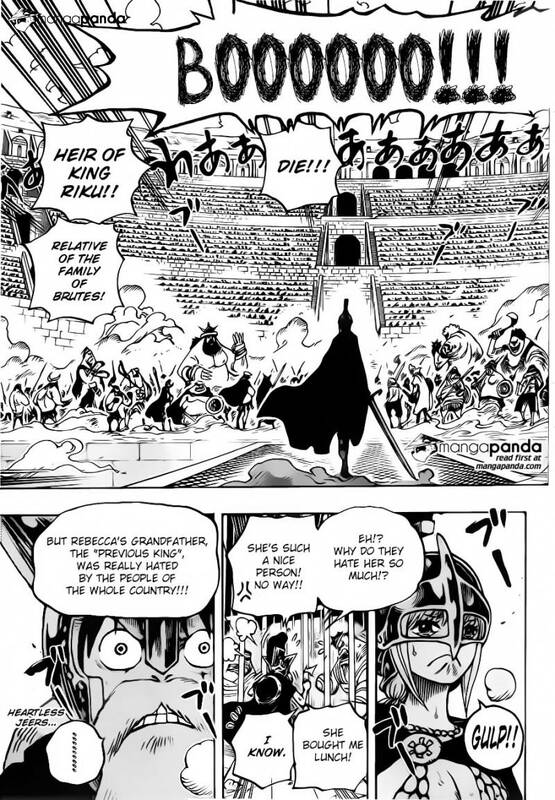 It was at that time that Doflamingo became the new king and used propaganda to make the old king hated. Over the years he continued to protect her until it became difficult. He then taught to defend herself. As Rebecca enters the ring it becomes clear that she’s as hated as the former king was, her grandfather. Do you think Rebecca will win her block? Do you think Rebecca will get the “Mera Mera no Mi” fruit? This chapter was a little disappointing and short (or at least seemed so). First the most incompetent shinigami “Marechiyo Omaed” was reintroduced. His sister begs him to stay because she’s afraid he states that he has to protect soul society. I don’t know how he’s planning to do that but I guess well see as he’s confronted by Stern Ritter (BG9). Next Captain Hitsugaya and Rangiku fight another poorly named Stern Ritter (Bazz-B). Personally I don’t like the fact that apparently Hitsugaya needs Rangiku to aid him in battle otherwise he’s useless or close to it. I’ll have to re-read the chapter to better understand what his “Vacuum Multi Layer Ice Wall” actually does. 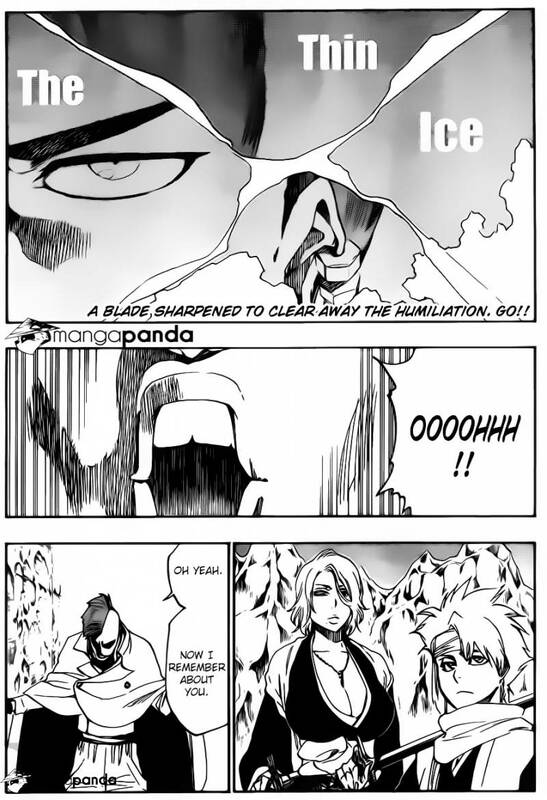 Did you understand Hitsugaya’s technique? Can Omaed win his battle or will Soi Fong save him? Things start to look dire for Naruto and his compatriots. 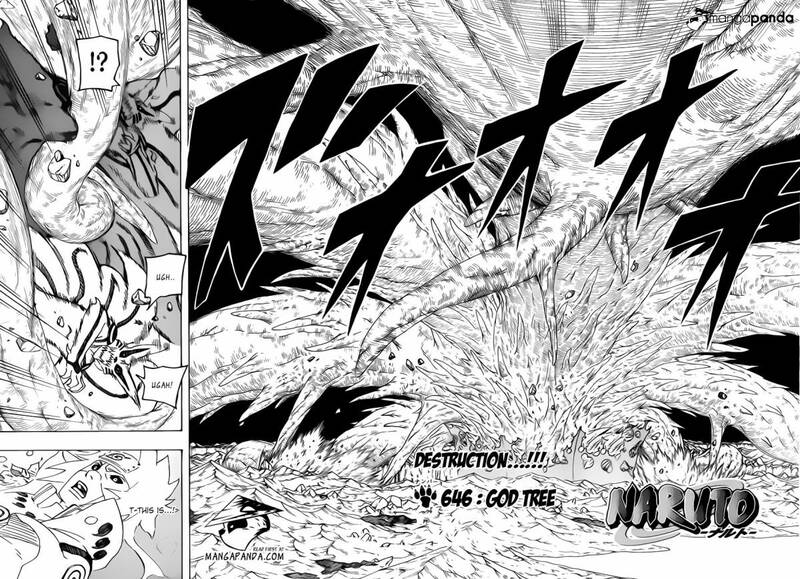 The appropriately named “God Tree” emerges from the ten tails. The God Tree begins to instantly absorb chakra from the ninjas. Madara while fighting Hashirama explains what’s occuring and tells the origin story of all ninja’s and of “Kaguya Otsutsuki“. The origin story seem rather similar to most religious creation stories. The best part of this episode was the return of the third. I assumed he was dead due to Obito ability but I’m glad I was wrong. Hopefully in his old age and wisdom he might be useful in some way and let’s not forget the Five Kages who haven’t arrived. This chapter seemed to complete the why Madara and Obito sought the ten tails. I excited to see how Naruto over comes this. Will the five kages arrive in the next chapter? Will the third be helpful?